The Scotch mist that wafts around Duart Castle at the opening of Rachel Maclean's new film speaks volumes about where she's coming from; this major commission for the Mull-based Comar organisation looks like a big leap towards something even more ambitious than her previous work. Films such as LolCats and Over The Rainbow became pop cultural cut-ups, featuring green-screen footage resembling Lady Gaga and Katy Perry video stylings. 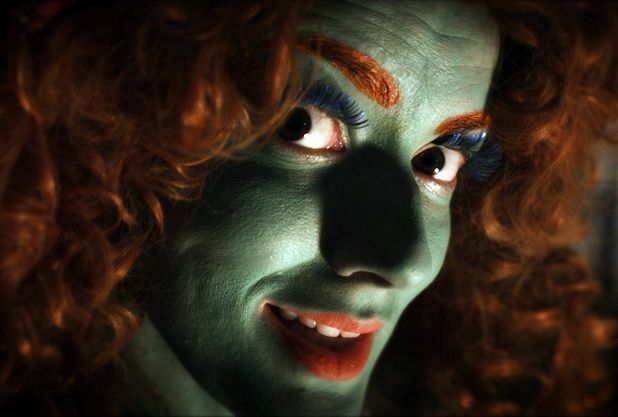 In them, Maclean played a multitude of day-glo cosplaying creatures lip-syncing dialogue she had sampled and rearranged from an eclectic array of film and TV sources, to create her own fantastical narratives. However, following her three-screen, epic dissection of broken Britain in the Oliver-sampling Happy and Glorious, The Weepers sees Maclean put flesh and blood on her dressing-up-box, multi-tracking as she directs real live actors in a bricks-and-mortar setting. Not that there is anything remotely resembling kitchen-sink naturalism about this 25 minute short that looks to tartan kitsch, Beast in the Cellar-era Hammer horror and the sort of dungeon-dwelling history-based Scots gothic that used to clog up Halloween tea-time TV schedules. Scripted by Andrew Cattanach and with an original soundtrack by Sorren Maclean and Hannah Fisher, Maclean's film sets out its store from the off: the grim-faced Doctor turns up at the labyrinthine ancestral home of Lady Maclean to take stock of the bright-eyed tat that forms the detritus of the Maclean clan's crumbling pile. Given the filmmaker's name and the fact that her reimagining of the legend of the Bean Nighe or Washer Woman – a grotesque spirit who wrings out the blood from the grave-clothes of those close to death – was filmed in the actual seat of the Maclean clan, such an in-joke is a way in for Maclean that provides dramatic riches for what follows. Played by well-known comic actor Steven McNicoll, the Doctor's hang-dog dourness is off-set by the fruity faux politesse of his hostess, who sounds like a well-primed Jean Brodie – if Muriel Spark had rewritten her for the Sunday Post funnies page, fed her shortbread and given her a Vivienne Westwood/See-You-Jimmy make-over. It is after hours, however, when things really come to life, as a wailing oversize woolly mutation duly fleeces the Doctor, allowing the Maclean dynasty to lurch on in the shadows unmolested. Beyond the pantomimic wit and close-up melodrama of The Weepers, there is an inherent seriousness in a film that seems to stem from a time when artists’ films could still flirt with a mainstream which accepted them in part, even as it kept its distance. This is a trope that has been picked up by the likes of The League of Gentlemen and their assorted offshoots, whose high-camp pastiches of clunky Grand Guignol are nevertheless meticulously observed. And in Maclean's hands, Celtic twilight clichés become something altogether more dangerous, in this darkly comic miniature masterpiece. An Tober, Tobermory, Isle of Mull, until Sat 27 Sep.